Walking down a nearby trail this weekend, I passed a patch of golden buttercups. A few minutes later I found myself singing “Build Me Up, Buttercup” as I bobbed down the trail. It got me thinking about other captivating flowers that have inspired musicians. This playlist may give you a few new songs to sing as you hike past wildflowers this spring and summer. 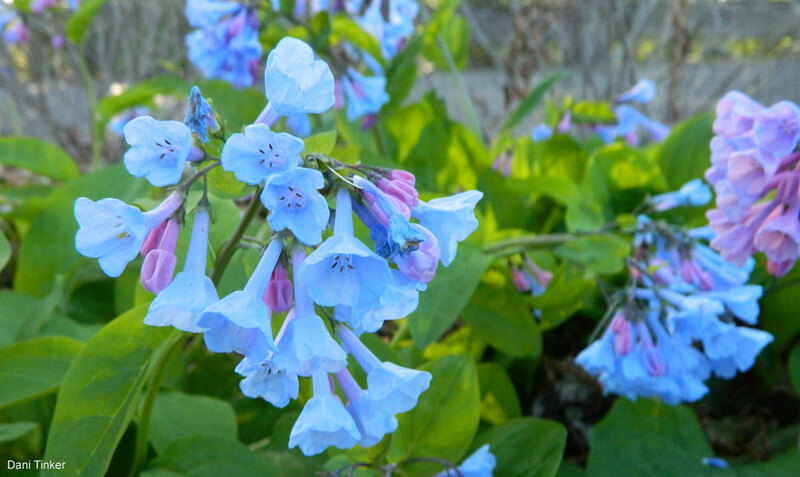 There’s no better way to ring in spring, than Virginia bluebells. The flowers are visited by long-tongued bees, butterflies, hummingbird moths, and a variety of other pollinators. Virginia bluebells in spring by Dani Tinker. Named for their love for sun, these flowers are sure to brighten your day. You can plant native species to attract wildlife to your yard. Birds will eat the seeds, while many bee species enjoy the nectar and pollen. Native sunflower species at Pleasant Valley Conservacncy. This photo, “Heliopsis helianthoides,” is copyright 2013 by bwinesett under a CC BY-ND 2.0 license. This song is one of the state songs of Colorado for good reason. A valley covered in these blooms is breathtaking. The native blue columbine is pollinated (depending on the elevation) by the hawk moth, hummingbirds, bees and bumblebees. Wildflowers in remote mountain valley in Colorado. Donated by National Wildlife Photo Contest entrant Greg Ochocki. I get very excited about this showy wildflower. Bees, hummingbirds and butterflies will be equally excited to see this plant in your yard. Tiger lily and tiger swallowtail in California. Donated by National Wildlife Photo Contest entrant Shelley Ellis. And about a million other songs. The variety of rose species is equally extensive. All sorts of sizes, shapes and colors are out there. If you’d like to add rose to your yard, just make sure it’s native. Bumble bee on swamp rose in Virginia by Dani Tinker. Though most lotus species found in the United States have been introduced, there are a number of native lily species you can add to your backyard marsh. Exotic lotus blossom at Kenilworth Aquatic Gardens by Dani Tinker. Although attractive to people, this flower has special appeal to its insect pollinators. The banner petal has a white or blue spot, telling pollinators whether the pollen is fresh and sticky. Take a look in the photo below and see if you can tell the difference! Though not a pollinator, this damselfly perches on bluebonnet in Texas. Donated by National Wildlife Photo Contest entrant Andrea Salas. The only apple native to North America is the crabapple, a gorgeous spring bloom. Plus, wildlife (like cedar waxwings) will eat the fruit. Cedar waxwing in a crabapple tree. Photographed by National Wildlife Photo Contest entrant Kenneth Janes. You didn’t think I’d forget to add this to the list, did you? It’s a classic. The flower has an open shape, which bees prefer. It provides enough space for the bees to gather pollen. The petals have lines, guiding pollinators to the center of the flower. The lines and other patterns are most visible with UV light, which is the wave length that many bees see. Buttercup in Virginia by Dani Tinker. Now you can rock-out while enjoying plants in your garden! It’s better for wildlife and the ecosystem they depend upon. This is the first step to becoming a Certified Wildlife Habitat.